My last guerilla gardening act of the year was to go for a walk in the neighbourhood and scatter the seeds that had not made it into my spring plantings. Maybe they won’t grow but at least they have the chance, and I’m keeping my saved seed turning over. The seedlings are doing well. Hard to believe the one on the left will become a huge tree and the one on the right will become a spreading prostrate wattle! In the dye garden, everything has been doing well. We’ve had only one really punishing day of 42C so far this summer –so things are looking good for now. The daylilies have bloomed beautifully. The Japanese Indigo came up well, and now the task is to keep it alive through summer. This time I planted some in pots to see if it does any better than in beside the vegetables. The tiny marigolds in the centre picture are flowering now, and a friend from the Guild has given me some dye marigolds that grow to two metres. They have managed the vegie beds so far! The madder, on the right, is rampant. The kangaroo paws have done well. The birch trees are barely holding on because brushtail possums are eating their leaves so enthusiastically. The tansy is big enough for me to use it this year. 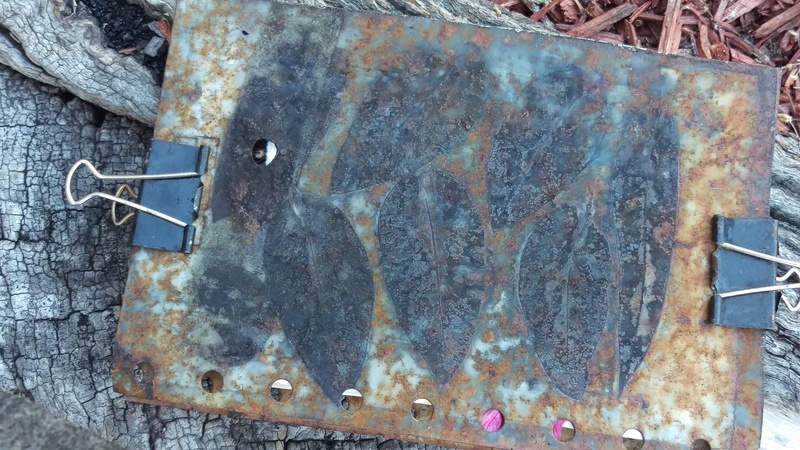 Our Eucalyptus Scoparia has suffered from the possums even more than the birches! But it is still alive and we are trying our third strategy for keeping the possums at bay. I have enough woad to create woad vats this summer! And I’ve saved seed from the dark hollyhocks. And–this year I’ve seen skinks and geckos but also this wonderful creature! Something is working well in our backyard. It seems so long since I went to Beautiful Silks in Allansford for Summer Dye Camp and yet–no post. The tutor once again was Jenai Hooke, full of expertise and inspiration, and dye camp was wonderful! We dyed with fresh woad from the garden and ice. 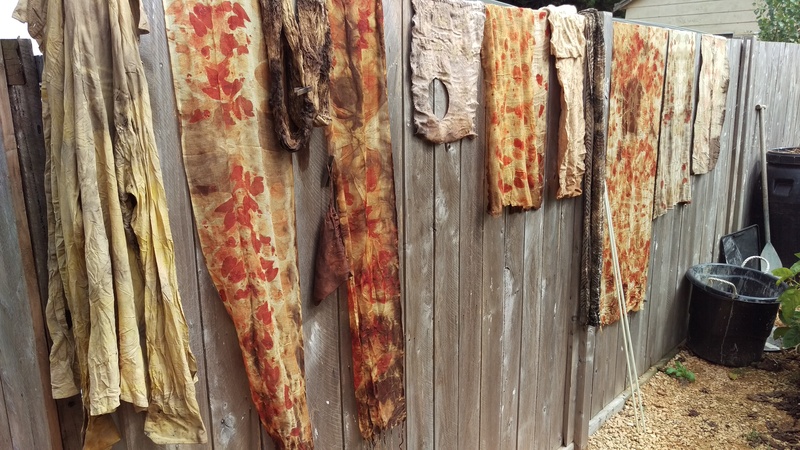 My fellow dyers did all kinds of amazing things with indigo and leaves. The crowd at Beautiful Silks never fails to be full of inspiring and interesting humans. This is a strategy for dyeing yarn that would never have occurred to me. Stunning in the skein (and all multi coloured skeins have their challenges). I dyed with indigo and with eucalypts. I learned a new-to-me and very effective way of mordanting with soy, and was re-educated about the importance of scouring. I made indigo circles for later use, inspired by Jude Hill’s indigo moons on Spirit Cloth. There was so much more! 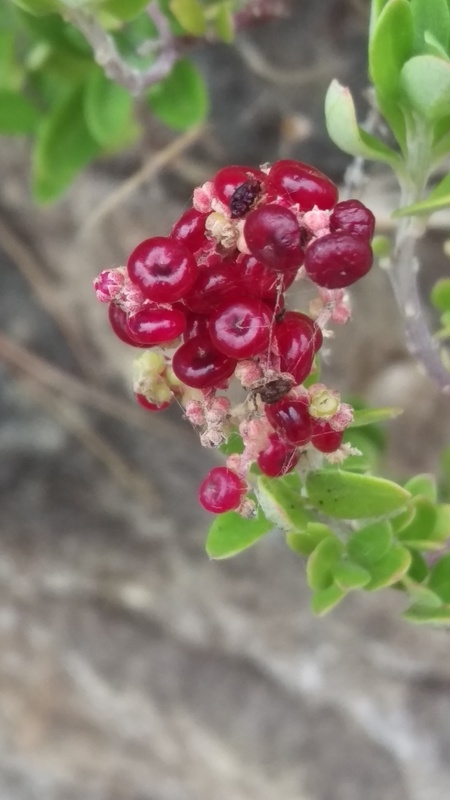 Madder, cochineal, walnut, tannins, mud, indigo painting… what a fabulous way to spend a holiday, plus the glorious time spent in Warrnambool and surrounds. Highly recommended. Over summer I worked on my indigo dyeing skills. In case it isn’t obvious–there will be some time travelling blog posts, because there is a lot I did over December and January that we haven’t discussed, my friends. Here is my Indigo fructose vat on day 1. The indigo vat went quite well but I felt I still didn’t manage to extract all the blue from it. Most weekends I dream of cranking it back up, and fail to manage the time. This is my latest attempt at a fermentation woad vat. It does look promising! I used all of this summer’s woad harvest (admittedly it was small this year) and one of the hottest weeks of summer and still failed to get the vat to reduce. 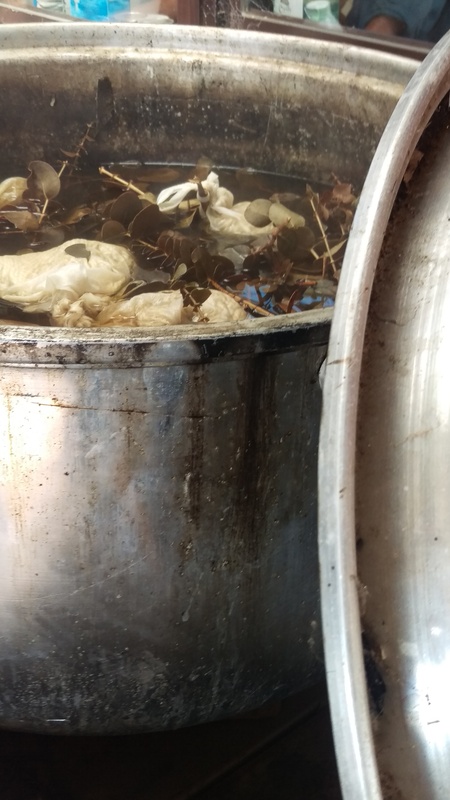 I do think constant heat is the thing I really need to sort out for this method–but Jenai Hooke gave me a gift indigo ball at summer dye camp which might kick start the process when I am ready to try again! I dyed washed fleece and some fabric, but the main project for the indigo vat was to dye some knitting a dear friend had done. She describes herself as having a midlife crisis which she is managing, in part, by knitting a lot, I mean A LOT of beanies. In the last six or twelve months she has scaled up to knitting gauntlets (arm warmers) and sharing the love of those. She gave me natural white knits and asked if I would indigo dye them and at last I’ve done it. They are, she said, knit from wool from sheep who grazed in the fields of France where many fascists died. I think these are for herself. Since I put them in the mail, I have received a great photo of her wearing them, grinning spectacularly and with a message saying she is taking them to Berlin. Berlin! The rest of my pile of beanies has headed out into the world too. Some to a climate activist I know who is studying in Canada and finding the snowy winter and the prospect of climate catastrophe very challenging (she can choose one and gift the others), and a big pile to my dear friends in Tasmania. When I saw them recently, one of then was wearing a very stretched out eucalyptus dyed beanie that only I could have spun and knit, and clearly wears beanies all year round. And, they know a lot of cash strapped people in Tassie who might feel the same need. I figure they will know what to do with a pile of hand knit happiness. …some more fat yarns spun from the fleece of a sheep called Lentil, which have now gone to their new home with a friend who likes to knit fat yarns. Plus some yarn that had been dyed in a very weak vat of indigo or woad at some time in the past, now a soft green with some help from soursobs (oxalis), a common weed here. When we were at Marion Bay (cough) I carded a lot of wool, and did some blending. But I’ve also spun up all manner of wool dyed previously, including the last of the earth palette dyed wool. There was a request for bulky yarn from one friend in particular. She’s managing the state of the world by knitting a lot of beanies and gauntlets. So I sent more yarn. And there was some very pale woad dyed wool that went into a vat with soursobs I weeded at someone else’s house. This is the Orphans for Orphans sweater from Knitting for Peace. This is the third time I’ve knit this design and it is an ingenious, easy pattern that lends itself to wool in odd amounts and various colours. This one is made from handspun local wool and dyed with plants from my garden: woad, coreopsis, eucalyptus, woad + coreopsis. Sometimes it happens that I look at a random selection of yarns and suddenly see what it could become. This was one such case. It has some wonkiness to be going on with, but quite frankly, any jumper that isn’t wonky before it goes onto a small person hopefully becomes wonky through sheer activity soon afterward. I’m reliably informed that the recipient is a fine appreciator of knitwear and that she held it close all the way home. That’s a lovely start! Over the holiday, more local fleeces arrived. This is the view down into a chicken feed sack full of greasy fleece. I washed, I dried wet fleece in summer heat, I even managed to do some carding. I now have various wools dyed with woad or indigo exhausts as well as good old naturally brown or grey wool. 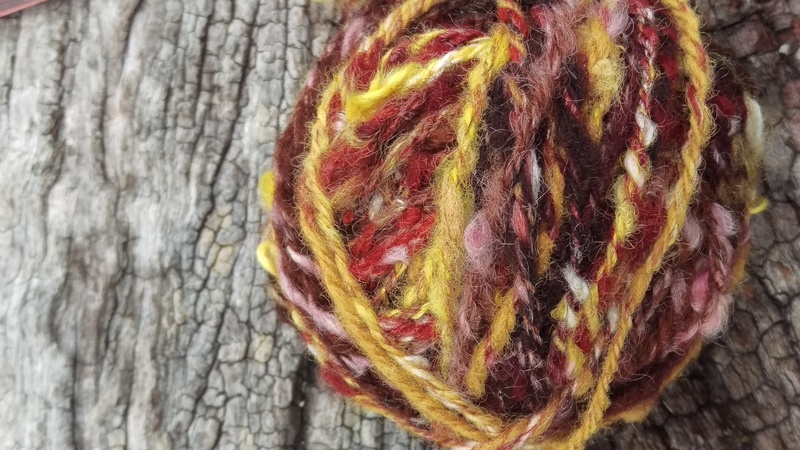 I have taught a few beginners to dye at our evening spinning group at the Guild in the last while (or at least, I’ve been one of the people helping them to learn) and sometimes people are just so overcome at being given wool. In the future they will know that the real gift is time and effort. But I do try to let them know that I have a lot of wool and that I am happy to share. People were generous to me as a beginner spinner, and I love to share spinning (as well as wool). I finally spun some llama fleece a friend at the Guild gave me in the spirit of adventure. It came out OK but it did have a lot of guard hair in it, so I’ll have to give thought to what it might become. Here’s a another skein–woad on grey, I believe. Now for something totally out of its logical place in the order of things. Before I went to Allansford, I decided to go all out in exploring the depths of my ignorance. It’s my observation of learners that many of us over estimate what we know. We haven’t grappled with our own ignorance sufficiently to realise what a teacher has to offer us. We haven’t applied what we think we know enough to realise where its outer edges are. I decided on an all out attempt to use my stock of knowledge and supplies to find the limits of my own understanding. I’d been itching to dye and unable to find time, so holidays were a gift. 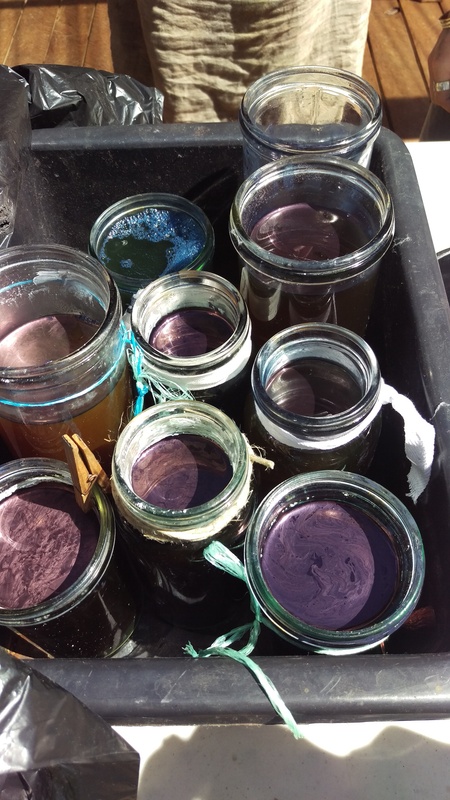 I had multiple attempts to dye with woad and then turned over to dyeing with what indigo I still had. I used up my remaining fructose, and couldn’t find more. So I experimented with sad fruit from the bargain pile at the local shops. I also collected fallen fruit and such. I read all the books and instructions again. 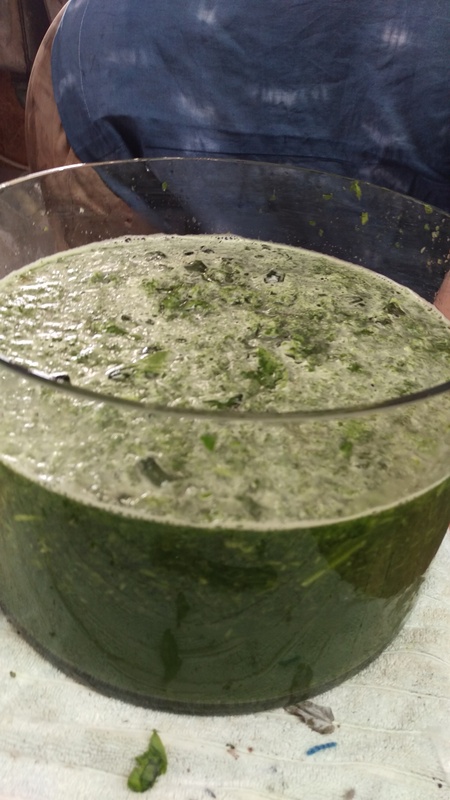 I had no joy with the woad no matter what I did and in the end composted two vats. I tried a yeast vat. It was quite something watching it fizz! In the end, I weakened and bought another package of colour run remover and rescued some indigo with that. between all these vats, I overdyed leaf prints I hadn’t liked much. I dyed scraps and offcuts from old shirts that had been turned into drawstring bags. I even tore up a very worn, patched and mended damask table cloth from the stash and dyed that. I achieved only soft blues, but soft blues are beautiful. I went to Allansford convinced that I was struggling with achieving reduction, and maintaining temperature, and quite possibly other things besides. And it was really helpful to go, knowing this, and to be able to see that I had been aiming (mostly) at the right things, checking (mostly) the right things, and had some concepts right, but was applying them in wrong places. It gave me a really strong sense of the limits of my own judgment. Some of the bits and pieces have already begun to re-form… a bit like my understanding of how to dye with indigo! Over the holidays, I went to a summer dye cap at the Botanical Studio run by Beautiful Silks, in Allansford (near Warrnambool) country Victoria. I stayed in a cabin at one of the caravan parks by the beachfront in Warrnambool because the on site accommodation was booked out. I haven’t been to Warrnambool since I was a child. It was just beautiful. The frisking around of many small people on skates and scooters and bikes had me in mind of childhood holidays at the beach. I arrived early and had beach walks and runs before dye camp each day and long strolls through town too. My photos of scenery are a bit rubbish and really don’t reflect the glory. 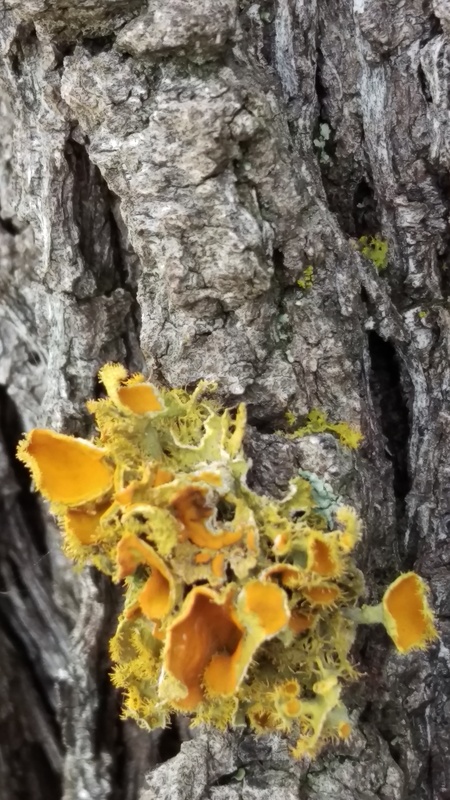 Like me, my photos are largely focused on small lovelinesses such as lichen. After dark there was spinning and some experimental printing on paper. Since I had the car to myself, I came with wheel and dye pot! I converted carding waste to yarn and knit some yarn bombs. One night I had a wonderful dinner with a couple of the other dye campers. I taught one of them how to cast on a sock and how to turn a heel with short rows, and we talked blogging and dyeing and, well, everything. Awesome and lovely. All round, it was a fabulous holiday. But dye camp! Dye camp was focused on indigo and woad. We had Jenai Hooke from Eudlo in Queensland as our expert guide and instructor, and I learned so much. There were some big fructose vats. The method I really do want to learn. Perfect. We learned how to start them, how to feed and tend them, how to dye in them. There was making of little vats so we could grasp the principles. There was a massive pot with leafy bundles in it. E Crenulata sent its spicy notes through us all on the first day. Who doesn’t love leafy bundles?? 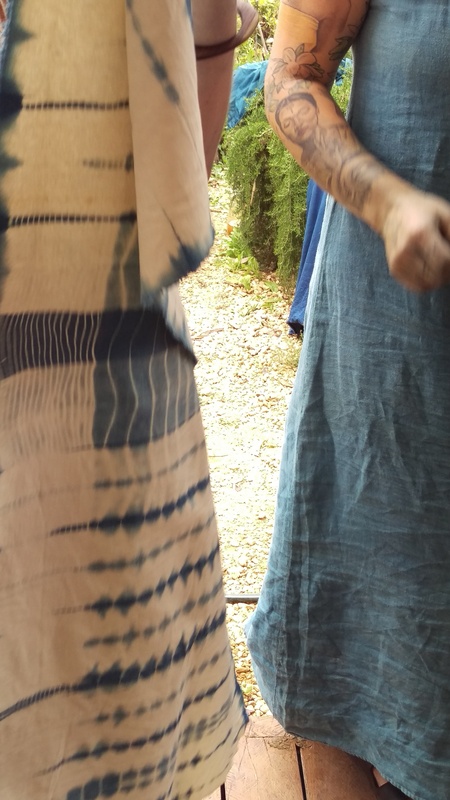 Some of my companions had brought along leaf printed samples, their own indigo dyeing, their hand made and dyed scarves and bags, samples of their wild and creative experiments in dyeing yarns, and of course their genius, skills, ideas and energy. There was hand sewn and hand made clothing, spontaneous pattern drafting and people’s own clothing designs. There were three other women from Adelaide, hurrah! In short, I was among my people, and this seemed to be a shared feeling. 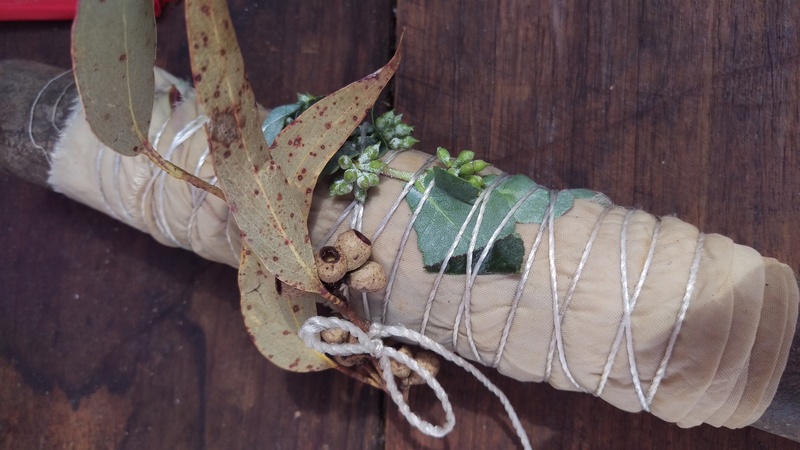 There was ice-dyeing with fresh woad leaves. 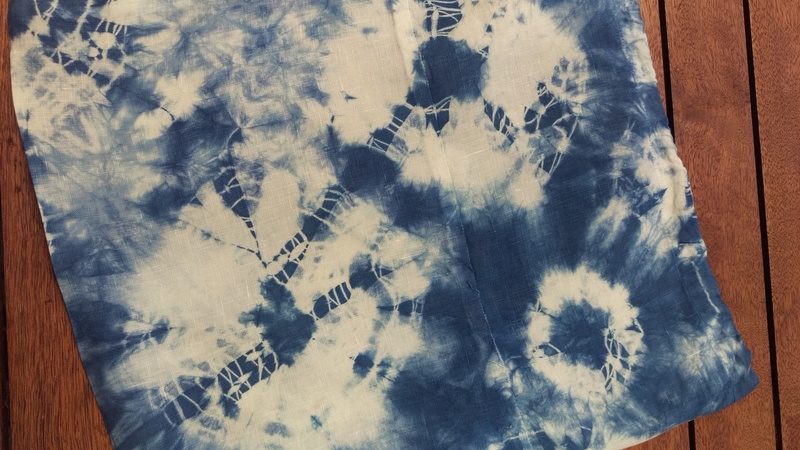 There was shibori. 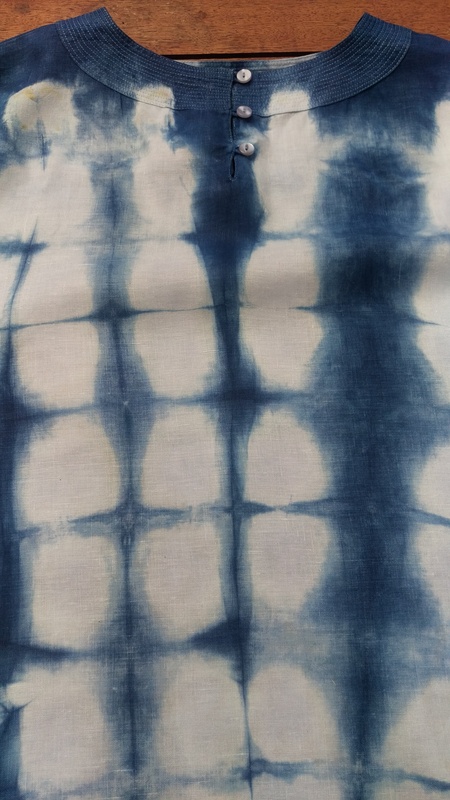 Jenai is a shibori expert and teacher, and taught the basics to some of us with spectacular results (the others were too busy dyeing to stop for that!). In short, there was dyeing. So much dyeing. I could not believe the number of garments and other things that turned blue. Light blue, mid blue, blue-black. 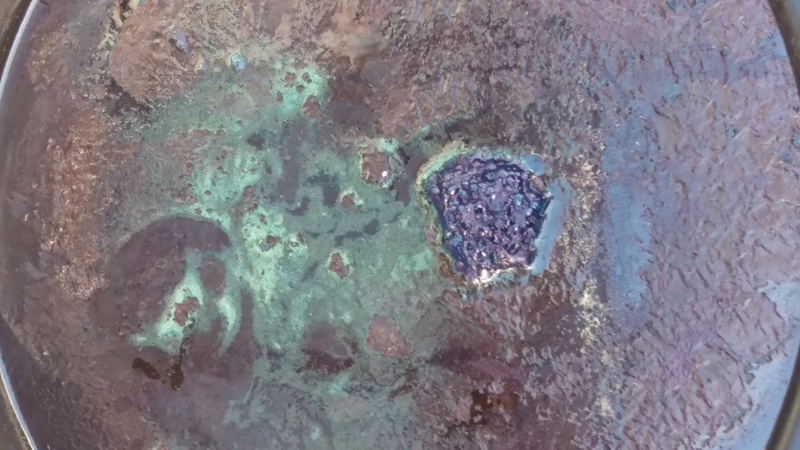 Turquoise-green colours from the ice dyeing. Oranges and browns from eucalypts. We ran out of drying space. I dyed bags. I know, shocking. I got deeper blues than before. I believe I deepened my understanding. 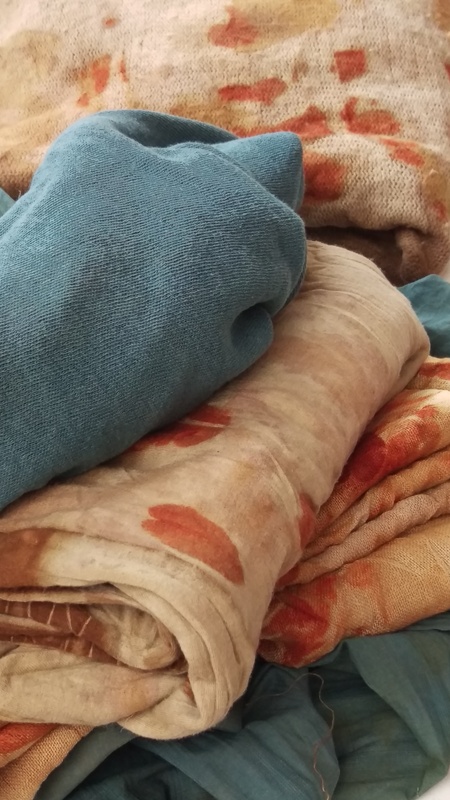 And it was good to be reminded of the complexity of the skills, the complexity of the process and the years of apprenticeship that would have been undertaken by historic dyers. A little humility is a good thing in the face of a large learning curve. I even dyed a linen shirt. I pulled it out of the cupboard where clothes go awaiting reincarnation, and felt moved to try it on (it was an op shop find). I decided it just needed a new button, and it was clamped and dyed and has been out in public several times already! Immense thanks to Marion Gorr and Elephant at Beautiful Silks for a wonderful learning opportunity and fabulous catering and company, and to Jenai Hooke for such wonderful education!